The success of Galli-Curci has often been described as “meteoric ” but familarity with her biography reveals that, as in the case with all really great artists, it is the result of long and hard work combined with extraordinary gifts. She was born in Milan. Her early ambition was to become a pianist. After her graduation from the Milan Conservatorio, with the first prize and diploma, she made many very successful concert appearances as a virtuoso pianist. Her repertoire was comprehensive, her technic brilliant and her tonal coloring brought high encomiums from the critics. After hearing Busoni at a concert, however, she was so overcome by the enormity of his technical skill that she went home, closed her piano and decided to abandon her musical career. It was then that she “discovered” her voice. It is more truthful to say that it was discovered by Pietro Mascagni the famous composer who was a friend of her family. Exactly six years after her debut as a piano virtuoso in Milan she appeared as Gilda in “Rigoletto” at the Teatro Costanzi in Rome with pronounced success. The marvel of it was that she had received no vocal instruction but had studied everything by herself. True, she had attended opera since childhood, and her family was musical; but what she achieved by herself is one of the startling instances of self-instruction in music. After her successes in Italy, Spain, South America and Cuba, she came to America, still a comparatively unknown singer in this country. When she was brought to the attention of Campanini, then impressario of the Chicago Opera Company, he immediately recognized her immense possibilities. Her debut in Chicago, November 18, 1916, as Gilda, was one of the most sensational appearances in American history. Since then her successes have been a continual procession of triumphs. Mme. Galli-Curci is a woman of exceptionally broad culture, remarkably well read, possessing a library in various languages (with which she has an uncanny familiarity) which would be the envy of many a college. Her husband, who accompanies her at all her concerts, is Mr. Homer Samuels, a well-known American composer of Welsh ancestry. Mme. Galli-Curci spends her summers at her palatial home in the Catskills, hard at work every day with Mr. Samuels and her mentor, Franz Proschowsky, continually endeavoring to expand and develop her art. Note that Mme. Galli-Curci speaks as an American, as she is very proud of her American citizenship. Demand for records of her voice is world-wide. Are Singers Born, Not Made? “It has always been my very decided impression that while only hard, long, unremitting work can make an artist, singers are unquestionably born with certain throat formations and certain mental and emotional endowments which are the essential basis for the superstructure of labor and persistence which in the end brings success. “It would seem silly to me to think otherwise. One can never make a crow sing like a thrush although they are both birds, both have throats and both make noises. You can never make a bass sing like a soprano nor a tenor sing like an alto. Their throat formation makes it impossible. In a less degree the throat of every human being differs just as the features of everyone is slightly different from others. ”Singing teachers, pointing to some singer with a poor natural vocal equipment but with great mentality, great soul and great persistance, who by dint of unremitting labor, attains success, preach, ‘voices are made not born.’ Naturally it brings them pupils; but it has been also the source of the cruelest kind of disappointment to thousands of students who, after years of study realize that they have spent their time and money chasing an ignis fatuus—a will-o-the-wisp through the swamps of musical despair. “Probably every voice can be improved by sensible, skillful instruction in the hands of a real vocal master, but every voice has its limitations that came to it with birth; and no singer and no teacher can pass beyond those limitations. If this were not true there would be a hundred thousand prima donnas in America now instead of a very few. The honest teachers know this and do not hesitate to state the truth to their pupils. “A musical and vocal ancestry does not always insure vocal success. Patti’s parents were opera singers, as were Malibran’s. My own mother was a singer but not a professional. My grandmother, Carolnia Galli-Rota, was a well-known opera singer, but her husband, Giovanni Galli, was an operatic conductor of note. I was eleven when I last heard my grandmother. Her voice is still in my ears. I heard her sing once the famous aria from “II Barbiere di Siviglia” Una Voce poco Fa, and the smoothness and brilliance with which she sang was unforgetable. I am sure that I absorbed a great deal sub-consciously through hearing my grandmother and other singers at the opera and at our home. “Italy has produced a great many singers of world renown. Some have attributed this to the climate, Some to the diet, some to the open air life. These may have helped; but it seems to me that the most important element in the success of the Italian-born singer is the Italian language itself. Its lovely open vowels, Ah, ay, ee, oh, oo, emitted from a perfectly open throat, tend to avoid from birth the obstacles with which many singers of other lands have to struggle. I often wonder why, on the threshold of vocal art, the voice teachers do not teach their pupils to read aloud sonorous sonnets and beautiful prose, giving each vowel its most beautiful quality. I am sure that a half hour or an hour a day, spent in cultivating a sense of vowel beauty, would be quite as valuable for many singers as time spent in so-called vocal exercises which are worthless because the vowel sense has not been developed. I would even urge them to learn the beautiful Italian language for this purpose; because the Italian poets and authors make a conscious effort ot (sic) have all of their sentences rich and beautiful in sound. “Of course poets in other tongues, Tennyson, Heine, Racine, Lowell, all strove to have their verses musical; but there is something about the Italian language that lends itself to the free emission of vowels so that the mere recitation of some of the Italian verse is as beautiful as a song. Mme. Elonora Duse is an instance of this. Her voice is music in itself. “America, like Italy, is a land that has produced many lovely voices; but the American singer on the threshold of her art must learn to speak with an open throat. Americans do not realize it, but the observer coming here first from a foreign land notices first of all that many of the people seem to talk with mouths almost closed. The jaws are stiff and there is no other thought than that of expressing oneself forcibly and lucidly. The educated Italian, on the other hand, tries to show his culture by talking beautifully. Such habits have come down to him for centuries. He has very little to overcome. The American, the German and the Englishman, on the contrary, often has to upset his vocal ancestry before he begins his vocal work. “The realization of beauty transmits itself to the voice without question. America is a glorious country and its natural beauties are unsurpassed. On the other hand there is still a great deal that is ugly in its cities. During the last twenty-five years the country has made great strides in beautification. This in time will show itself upon the American voice. In the Italy of Caruso and Gigli and other great masters of singing, the child is taught to love beauty—beauty in nature and beauty in art. Beauty is emphasized everywhere. America, until recent years, has been famed largely for its business prowess. The art instinct has been here as evidenced by the early American painters and by the poets, architects and others. But America had more serious business for its welfare on hand. Its great problem was to build, to utilize its territory, to assimilate the multitudes that were pouring in from all the countries of the world. “Whether you realize it or not, America is now at the period of its Renaissance, its spiritual rebirth. The great war gave us a wonderful national quickening of our ambition to become a cultural as well as a commercial nation. America’s attitude toward the unfortunate in other lands, even in enemy lands, has been ennobling. It has commanded the admiration of the world. We still lack in contemplative moods, in serenity, calm and in the observation of the beautiful. There is a conspicious (sic) neglect of poetry. Americans do not seem to understand the value, the inspiration, the refreshment that is to be derived from poetry. All these things take time. “If we are to consider the thresholds of vocal art, it would be absurd to talk learnedly upon the subject and fail to treat upon these principles of life upon which all great ultimate success must depend. All these things have a phychic effect upon the voice and upon the art of singing. They are of vastly more importance to the future of vocal art in our country than are solfeggios and teachers with big names. “The singer’s musical knowledge is also fundamental. The time is coming when the vocalist who has the voice of an angel and the musicianship of a poll-parrot will have difficulty in drawing large audience. “Learn an instrument by all means. The singer cannot well begin vocal work in earnest before the age of eighteen or nineteen; but during the previous years she can perfect herself as the performer upon some instrument and ever after have the great advantages that this will bring her. I began the study of the piano at the age of five. I heard practically all of the notable operatic performances at La Scala until I was seventeen. At first I practiced piano about one and a half hours a day, eventually practicing three hours a day. At the Milan Conservatory I had to learn the major works of Beethoven, Haydn, Mozart, Schumann, Chopin and Bach. I played the Chopin E Minor Concerto and all of the “Forty-Eight Fugues of Bach.” After graduation, in addition to my work as a concert pianist, I taught pianoforte for four years. This experience, as well as that of having the guidance of musical parents, was of incalcuable (sic) value to me. I can well remember my father playing over the score of such an opera as “Tristan and Isolde” before going to his office. In such an atmosphere it was difficult not to be a musician. This conference will be continued in the next issue of The Etude Music Magazine, in which Mme. Galli-Curci will present some of the very exercises she used in her own work when she was training herself without a teacher for her vocal career. You are reading The Thresholds of Vocal Art - MME. 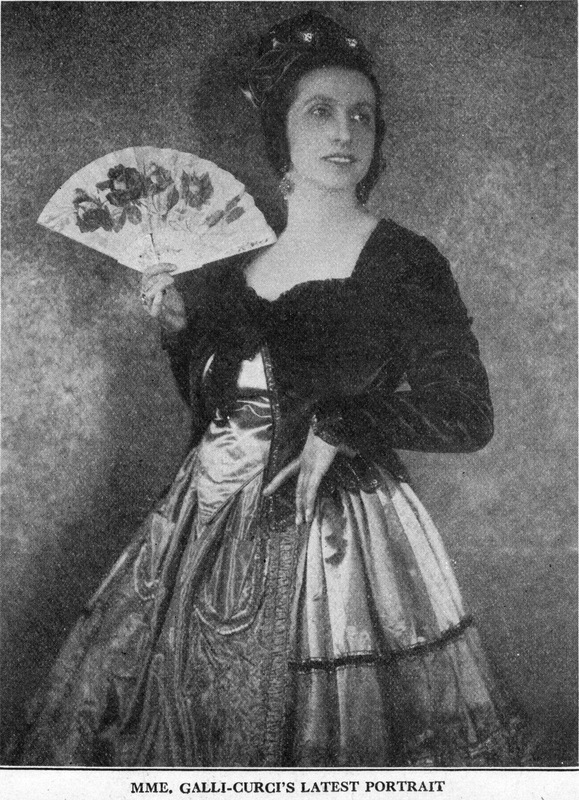 AMELITA GALLI-CURCI from the January, 1924 issue of The Etude Magazine.